Just when you thought it couldn’t get any better, we present our unique wrap around bed frame modified to include the frame for a canopy top. Amish made of solid oak, cherry or hickory, and designed to last for generations. 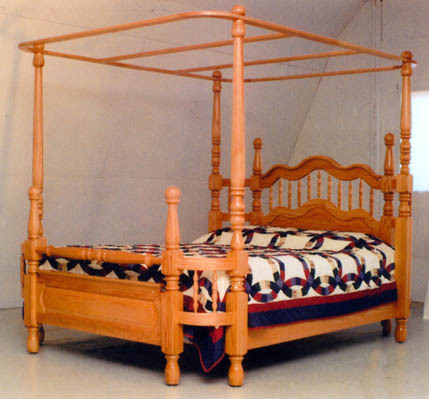 The wraparound bed is the centerpiece of our Amish crafted bureau-style bedroom set, that also includes matching night stands, dressers and chests of drawers. We think you’ll agree that this bed will look beautiful in your home, and you’ll be back for the rest of the collection at your first opportunity! Available in King, Queen and Full size in your choice of solid oak, cherry or hickory hardwoods.